The beer run is the closest thing First World adults have to pack-hunting game in the hinterlands. It’s an adventure based on immediate necessity, with the heroic goal of providing life-sustaining provisions for a larger group running low on supplies. 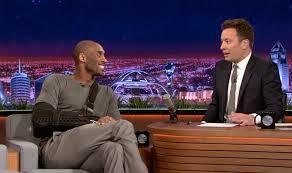 Often, bizarre combinations of characters convene on these runs with the common goal of finding booze, and you’ll be hard-pressed to concoct a weirder duo than Kobe Bryant and Jimmy Fallon, who reminisced about a beer run they made in 1996 during Wednesday night’s episode of The Tonight Show Starring Jimmy Fallon. It’s a simple tale: Both were relatively unknown talents in their respective industries. Both were at a party running low on beer. Both stepped up to save the tribe from drought-like conditions. Fallon explained it was the first time they had met, and both being new to Los Angeles, they set out on their quest without any idea as to where they could find beer. They tried anyway, because they had thirsty mouths to feed.